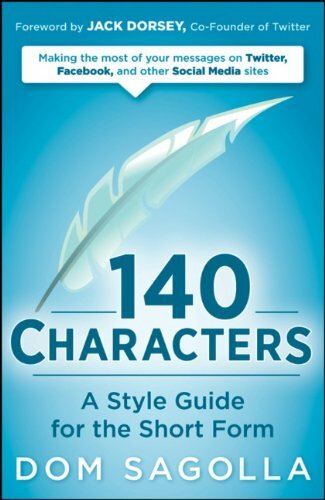 140 Characters: A Style Guide for the Short Form Do you have trouble understanding Twitter? Whether you want to use it for marketing or social purposes, you still have to understand the language. Here is a list of the more popular terms to get you up to date. Tweet – Your 140-character or less message . This is the backbone of the site. Twitterism – Any word that is only used by the Twitter community. They are generally formed by putting the letters TW before a basic word, like Twaffic in place of traffic. Twitterjacking – Where people hack other twitter accounts and pretend to be that person. Celebrities are particularly vulnerable to this. Twitterer – Any user of the site. Also called Tweeple on occasion. Twitterverse – The whole society of people who use the site. This includes both those using it for business and those just using it for social reasons. Also sometimes called the Twitosphere. Twittersona – Someone’s Twitter persona. Retweeting – Alerting those following you to another person’s tweet. You are basically quoting that person’s tweet and re-posting it on your account. Just make sure it’s clear you didn’t originate it. You must add RT at the beginning and then provide the user name of whoever you are quoting. For instance, if you are quoting LynnTerry, you would say RT @LynnTerry and then the message. If you don’t format it this way, you are actually claiming their tweet as your own. This is a violation of Twitter policies, and could get you in serious trouble. Followfriday – This is where you provide the user names of people that your followers should follow themselves. You don’t necessarily have to include a reason. You format it #FF @the user name of whoever you are suggesting. Twaffic – All the visitors you get from using Twitter. Tweekend – When you devote an entire day of the weekend to using the site. De-Follow – When you stop following someone. It’s a play of the standard “de-friend” term used by most social sites. Hashtag – Tagging a specific tweet by placing the hash prior to the tag. For instance, you would put #pgatour if you were talking about the PGA Tour. Mistweet – When you send one of your messages to someone you didn’t intend to. Tweeps – Used to describe people following you that you also interact with on other social sites. There are many more terms to learn, and this just gives you a rundown of the essentials. You will discover the rest as you start using the site more regularly. Twitter can be a very effective marketing platform for your business. Did I miss any? Please post any other twitterisms you are familiar with in the comments.